Santacon 2014 – 32 bars and restaurants in midtown Saturday will be consider Santa’s Playground (photos). This year is the 20th anniversary of SantaCon! The first one was in San Francisco in 1994. • Butterfield 8 at 5 E. 38th St.
• The Australian at 20 W. 38th St.
• Vivid Cabaret at 61 W. 37th St.
• Reichenbach Beer Hall at W. 37th St.
• The Keg Room at 53 W. 36th St.
• Beer Authority at 615 Eighth Ave.
• Galway Pub at 7 E. 36th St.
• Suite 36 at 16 W. 36th St.
• Slattery’s at 8 W. 36th St.
• The Liberty at 29 W. 35th St.
• Playwright Irish Pub at 27 W. 35th St.
• Foley’s at 18 W. 33rd St.
• Feile at 131 W. 33rd St.
• Stout at 133 W. 33rd St.
• Jack Dempsey’s at 36 W. 33rd St.
• Rick’s Cabaret at 50 W. 33rd St.
• Blarney Rock Pub at 137 W. 33rd St.
• Rattle N Hum at 14 E. 33rd St.
• Nelly Spillane’s at 18 E. 33rd St.
• Maru Karaoke Lounge at 11 W. 32nd St.
• Joshua Tree at 513 Third Ave.
• The Thirsty Fan at 254 W. 31st St.
• American Whiskey at 247 W. 30th St.
• Slake at 251 W. 30th St.
• Red Room at 251 W. 30th St.
• Mustard Harry’s 352 Seventh Ave.
• Pioneers Bar at 138 W. 29th St.
• Tempest at 407 Eighth Ave.
• Mustang Sally’s at 324 Seventh Ave.
• The Big Man at 134 First Ave.
Rules: VERY IMPORTANT GIDE LINES. 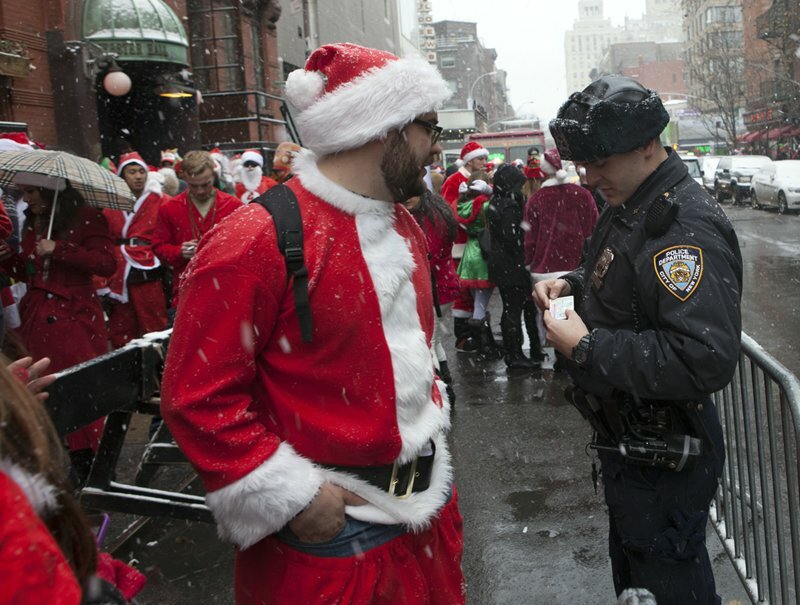 The following guidelines are to help you and everyone enjoy (PHOTOS) SantaCon 2014. They are not rules. SantaCon has no rules except that you must dress like Santa but if you take heed of the friendly advice below it will help keep you safe, warm and on Santa’s Nice list. For the purpose of SantaCon, “Christmas” is the name of a popular secular holiday and has no religious connotations (much like the word “holiday”). This doesn’t mean we don’t respect religious views. It simply means that taking part in SantaCon doesn’t imply you support any particular religion or doctrine. It’s just silly fun. Dress up! A Santa hat alone is not enough. You don’t have to dress exactly like Santa but the theme is red. That having been said, unusual interpretations of Santa-ness are often appreciated and Christmas trees, elves, reindeer themes etc. are all good. Watch out for elves. Elves work hard for Santa all year and especially hard during the holiday season. Santa loves his elves except when they show up to his red-themed event dressed in green. Traditionally, elves are abused at SantaCon. Not all these guidelines should be taken seriously. Some of these guidelines should be taken very seriously. If you can’t work out which ones they are then you are not intelligent enough to take part in SantaCon. Don’t get drunk in public. Being drunk &/or disorderly in public will tarnish Santa’s reputation. One bad santa can ruin things for an entire location because we’re all dressed the same, duh. Also, it’s an offense and will get you arrested. Remember that there is no “bail fund” for incarcerated santas and if you cross the line you’ll be on your own. Don’t be that Santa. If you do get drunk in public, you should get into a fight with other santas, get arrested as quickly as possible (before anyone gets hurt), be carted away in handcuffs and have the whole thing recorded on video for the evening news and Youtube. Optionally, bring gifts: Nice things to give children; nice or naughty things for adults. Do not throw your gifts at anyone, especially if those gifts are raw Brussels sprouts. Santa dresses for all occasions. If it’s cold outside, wear multiple costume layers. Dress to maximize merriment whether singing carols in the snow, or swinging from a stripper pole in a hot nightclub. Santa doesn’t whine! Some SantaCons are supremely well organized and others fall apart within the first 5 minutes. Some involve a lot of walking. Sometimes Santa is turned away. It’s all good fun if you choose to have a positive attitude. Santa does not mess with security. This includes the police. Security staff are there to ensure everyone’s safety – it’s an important & necessary job. Most venues welcome Santa but some security staff will see you as a potentially dangerous mob wearing disguises (which, let’s face it, is probably true). If you are turned away, don’t argue – just move on to somewhere Santa is more welcome and can have fun. Make sure you always tip the good people who are serving you. We want to be able to do this again new year so be polite and cultivate the goodwill of the local community. Please pay for your refreshments as you go. Santa gets tired of waiting on other santas to clear their tab before being able to move on. Ideally, this entire adventure should be cash only. No santa left behind! Don’t think only of yourself – Santa cares about his fellow santas. Pick a few people you know and keep an eye out for them especially when it’s time to move to another venue. If you don’t see them, speak up so other santas know to wait a moment. Every santa should have at least 2-3 other santas they look out for and 2-3 that look out for them in turn. Stay with the group. It’s not just a case of “the more, the merrier” – Santa is safer with large numbers of fellow santas and what one santa can’t achieve (or get away with) is a possibility for a posse. Santa doesn’t drink & drive. If you’re going to drink you must make sure that you can get safely home without driving yourself. Check public transport, carpool with a designated sober driver, make arrangements to sleep over at someone’s place etc. Organizers sometimes try to coordinate transportation for Santa – check the event details to find out if this is being done in your area. Santa doesn’t talk to the press. Even “ho, ho, ho” is controversial these days. Seriously, no-one speaks for Santa – not you, not me, not even Santa. You can express your opinion but, since you’re dressed like Santa, the media might treat it as Santa’s opinion. If you have reached this rule, it means you didn’t get locked into a loop reading the guidelines over and over again as per the previous rule. You are therefore probably intelligent enough to take part in SantaCon!